1967/78-The First & The Best, (Emerald Studios + Photo Finish). 1968/69/70-Taste, 5/Ago/68 + 17/Feb/69 + 2/Abr/70 + Feb/70. 1970-Audience Recordings. Frankfurt & Durlach 20/Sept/70. 1970-Taste, Tricksters Fake, Markthalle, Hamburg, Feb/70. 1970-Taste, Basel Stadthalle, Febrero/70, The Irish Werewolf. 1970-Taste, Stockholm, Febrero/70 + Interview. 1970-Taste, Ulster Belfast Hall, 12/10/70. 1970-Taste, Stockholm, 18/Sept/70. Different tracks. 1970-Tasting the Fairfield, Croydon, GB, Fairfield Hall, 6/Sept/70. 1970/71/72-Tasting the Beat Club, Germany. 1970/71/72-Pick Up Your Grip. 2 CD. 1970/72/74-Messin´with the kid (Wight+Europe72+Irish Tour). 1970/76-Dutch courage, Lowland Fest, Amsterdam 5/Junio/70 & 76. 1971-Sheffield, England, City Hall, Junio/71. 1971-Technische Hogeschool Twente, Enschede, Holland, Julio/71. 1971-1st British Rock Meeting, Speyer, Germany, 5/Septiembre/71. 1971-Cant Fight City Hall Vol:1, Cork, City Hall, 28/Dic/71, 2 CD. 1971-Cant Fight City Hall Vol:2, Cork, City Hall, 29/Dic/71, 2 CD. 1971/72-Two BBC in Concerts, 1/Agosto/71 & 13/Enero/72. 1971/72/76-Listen to this Bono, BBC´71,´72 & Los Angeles´76. 1971/74-Alan Freeman Archives. First song is half empty. GBT. 1971/74-Alternate BBC Sessions, 2 CD. 1972-Live in Verona, Italia. 20/Febrero/72. 1972-Scala Cinema, Ludwigsburg, Germany, Marzo/72. 1972-Cant Fight City Hall Vol:3, Cork, City Hall, 12/Mayo/72, 2 CD. 1972-Walkin´ Blues for Dublin, National Stadium, 13/Mayo/72. 1972-2nd British Rock Meeting, Germersheim, 22/Mayo/72. 1972-Lausanne, Switzerland (From Swiss Radio), 3/Junio/72. 1972-San Diego, California, Septiembre/72. Funky Headquarters. 1972-Allen Theatre, Cleveland, 8/Septiembre/72, 2 CD. 1972-The Belfry, Sutton, Coalfield, Dic/72, 2 CD. 1972-National Stadium, Dublin, Ireland, 26/Dic/72, 2 CD. 1972-Can´t Fight City Hall, Cork, Ireland, 28/Diciembre/72. 1972/73-Can´t get enough (2-Essen72+1-Frankfurt73) + fillers. 1973-4th in Concert-BBC 1/Feb./73 + 12/Ene./79+29/Dic./83. 1973-Victoria Hall, Hanley, Stoke, 11/Febrero/73. 1973-Colonial Tavern, Ontario, Canada, 19/Marzo/73. 2 CD. 1973-Colonial Tavern, Ontario, Canadá, 24/Marzo/73. 2 CD. 1973-Lottery Club, Aurora, 20/Mayo/73, 2 CD. 1973-Reading Festival, 24/Agosto/73, 2 CD. 1973-Agora Ballroom (WNCR), Cleveland, USA, 3/Sept/73. 1973-Capitol Theater, Montreal, Canada, 7/Sept/73. 1973-Jahrhundert Halle Frankfurt Germany 24/Oct/73, 2 CD. 1973-Ludwigshafen, Germany, 25/Oct/73. 2 CD. 1973-Stadthalle, Bremen, Germany, 31/Oct/1973. 2 CD. 1973-Musikhalle, Hamburg, Germany, 3/Noviembre/73. 2 CD. 1974-Tokyo, Samurai Stratocaster, 25/Enero/74. 2 CD. 1974-Tokyo, Japan, 28/Ene/74, “oh no, there goes Tokyo” 2 CD. 1974-Kouseinenkin Kaikan, Osaka, Japan, 28/Ene/74. 2 CD. 1974-Japan Tour, 29 /Enero/74. 2 CD. 1974-Cork City Hall, Ireland, 1/Marzo/74. 2 CD. 1974-A bottle of gin, Hippodrome London, 17/Marzo/74. 1974-Colonial Tavern, Ontario, Canadá, 19/Marzo/74. 1974-Victory Burlesque Palace, Toronto, 4/8/74, 2 CD. 1974-Velódromo Anoeta, San Sebastián, España, 26/Mayo/74. 2CD. 1974-Unknown Venue, 28/Junio/74. 2 CD. 1974-Liberty in Houston, Liberty Hall, Houston, 4/Agosto/74. 1974-Center Island, Toronto, Canadá. 11/Agosto/74. 1974-Live at the Agora, Cleveland, Ohio. 12/Agosto/74. 1974-Live at the Agora, Cleveland, Ohio. 13/Agosto/74. 1974-Cowtown Ballroom, Kansas City. ?/Agosto/74. 3 CD. 1974-Schaefer Music Festival, Central Park, NY. 7/Sept/74. 1974-Roslyn, NY, 8/Septiembre/74, Denim & Strat. 1974-Live in Brussels, Belgium, 21/Septiembre/74. 1974-Sir Wilfred Laurier University, Ontario, 7/11/74. 2CD. 1974-Rockin´ At Toronto Tour 1974, Noviembre 1974. 2 CD. 1974-Cork City Hall, Can´t fight city hall: 6, 28/Dic/74. 2CD. 1974-Songs for Romy, Irish Tour 74 & more. 1974/77/79-Calling Hard. Varios shows. 2 CD. 1975-Roll Over Beethoven, TV Special. 1975-Tokyo, Shibuka kokaido, 26/Enero/75. 2 CD. 1975-Teatro Monumental, Madrid, España, 7/Marzo/75. 1975-CCH Hamburg, Germany, 12/Marzo/75, 2 CD. 1975-Liederhalle, Stuttgart, Germany, 26/Marzo/75. 2 CD. 1975-I´m leaving for Ulm, Abril/1975, 2 CD. 1975-Palais De Sports, Metz, France, 10/Mayo/75. 2 CD. 1975-Ancienne Gar De La Bastille, France, 12/Mayo/75. 2CD. 1975-Brussels Forest National, Belgium, 13/Mayo/75. 1975-Ruisrock Festival, Turku, Finland, 9/Agosto/75. 2 CD. 1975-Maple Rock, Massey Hall, Toronto, 30/Sept/75. 2CD. 1975-Live at the Agora, Cleveland, Ohio. 28/Octubre/75. 1975-Lost at Sea, Record Plant, Sausalito, CA, 31/Octubre/75. 1975-Sheffield, City Hall, 19/Dic/75, 1 CD. 1975-Main Hall, Lancaster University, 2 CD. 1976/77-Live at the BBC. 2 CD. 1976-Aragon Ballroom, Chicago, Illinois, 16/Enero/76. 1976-Ain´t Too Bad, Muhlenberg College, Allentown, 7/Feb/76. 1976-USA FM. NY 8/Feb./76 & Cleveland 1/Nov./76. 2 CD. 1976-The Bottom Line, New York, 8/Feb/76. 1976-Valentine´s Rock, Spectrum, Philadelphia, 14/Feb/76. 1976-Souped Up Rory, Old Grey Whistle Test, 2/Marzo/76. 1976-Shepard’s Bush Theatre, London, England, 2/Marzo/76. 1976-Offenburg, Germany, 9/Marzo/76, 2 CD. 1976-Jaap Endehal, Amsterdam, Holland, 24/Marzo/76. 2 CD. 1976-Roda Hall, Kerkrade, Holland, 25/Marzo/76. 2 CD. 1976-Reading Festival, 28/Agosto/76, 2 CD. 1976-Warsaw, Poland, Red Flag Blues, 3/Sept/76. 2 CD. 1976-Rockpalast, Cologne, Germany, 6/Oct/76. 2 CD. 1976-Royal Oak, Detroit, Michigan, 3/Nov/76. 2 CD. 1976-Calderone Concert Hall, Hempstead, 6/Dic/76. 2 CD. 1976-Bingley Hall, Birmingham, England, 18/Diciembre/76. 2 CD. 1976-National Stadium, Dublin, 28/Dic/76. 2 CD. 1976/77-Garbage Man. Montreux 77 & fillers from ´76. 1977-Hammersmith Odeon, London, 18/Enero/77, 2 CD. 1977-Sight & Sound In Concert, Hammersmith Odeon, 19/Enero/77. 1977-De Montford Hall, Leicester, 7/Febrero/77. 1977-De Montford Hall, Leicester, 7/Febrero/77. 2 CD. 1977-Golders Green, Hippodrome, London, 4/Junio/77. 1977-Chequered shirt wizzard, Montreux Casino, 22/Julio/77. 1977-Garbage Man, Montreux Casino, 22/Julio/77. 1977-Rockpalast, Gruga-Halle Essen, Germany, 23/Julio/77. 1977-Rockpalast, Gruga-Halle Essen, Germany, long version. 1977-Ghent Festival, Belgium, 25/Julio/77, 2 CD. 1977-Zeppelinfield, Nuremberg, 3/Septiembre/77. 2 CD. 1977-Nagoya Shi Kokaido, Nagoya, 25/Octubre/77. 2 CD. 1977-Festival Hall, Osaka, 31/Octubre/77. 2 CD. 1977-Shinjuku Kouseinenkin, Tokyo, 3/Nov/77(Evening Show) 2 CD. 1977-Tokyo, Japan, Afternoon Show, 3/Noviembre/77. 2 CD. 1977-Tokyo, Japan, Evening Show, 5/Noviembre/77, 2 CD. 1977-E.R.T.B.F. “Folies” 27/Noviembre/77 + fillers. 1978-Only In It For The Music. 1978-Horton Festival, Norway, 2/Julio/78 + Viena + German TV. 2CD. 1978-Vienna Austria 18/Agosto/78 + Dijon France 19/Marzo/82. 1978-Jaap Endehal Amsterdam, Holland, 25/Septiembre/78. 1978-Sporthalle, Cologne, Germany, 28/Sept/78, 2 CD. 1978-Offenbach Stadhalle, 3/Oct/78, 2 CD. 1978-Hemmerlienhalle Nuremberg, Germany, 7/Octubre/78. 2CD. 1978-Off The Boards, Lille, 10/Octubre/78. 1978-Burdeos, Francia, 19/Octubre/78. 2 CD. 1978-L´Olympia, Paris, France, 24/Octubre/78. 2 CD. 1978-Pavillion, Paris, France, 24/Oct/78, 1 CD. 1978-Pavillion, Paris, France, 24/Octubre/78. 2 CD. 1978-Tivolis Koncertroom, Copenhagen. 27/Octubre/78. 2 CD. 1978-Chateau Neuf, Oslo, Norway, 29/Octubre/78. 2 CD. 1978-Park West, Chicago, Illinois, 9/Noviembre/78. 1978-The Bottom Line, New York, 10/Noviembre/78. 1978-Starz Club, Philadelphia, 17/Noviembre/78 + Interview. 2 CD. 1978-Starz Club, Philadelphia, PA, 18/Noviembre/78. 1978-The Agora Theater, Cleveland, 20/Noviembre/78. 2 CD. 1978-El Mocambo, 21/Noviembre/78. 2 CD. 1978-El Mocambo, Toronto, 22/Noviembre/78. 2 CD. 1978-Shadow Play, Old Waldorf, San Francisco, 3/Dic/78. 2 CD. 1978-National Stadium, Dublin, Diciembre/78. 2 CD. 1979-Super Golden Radio Shows 016 (Middlesex 79). 1979-Pabellón de Deportes del Real Madrid, Madrid, Feb/79. 2 CD. 1979-Rockpalast, Wiesbaden, Germany, 6/May/79, 2 CD. 1979-Montreux Casino, Montreux Jazz Festival, 18/Julio/79. 1979-Albany, USA, JB Scott´s, ??/1979. 2 CD. 1979-Texas Opry House, Houston, 24/Agosto/79. 1979-The Bottom Line, NYC, NY, 6/Sept/79. 2 CD. 1979-My Father`s Place, Roslyn, USA, 7/Sept/79. 2 CD. 1979-El Mocambo Club, Toronto, Canada, 14/Sep/79. 2 CD. 1979-CCH, Hamburg, 30/Septiembre/79, 2 CD. 1979-Westfalen Halle, Dortmund, Germany, 10/Oct/79. 1979-Live in Sittard. City Hall Sittard. 18/Oct/79. 2 CD. 1979-Solnahalen, Stockholm, 27/Octubre/79, 2 CD. 1979-Koncerthuset, Stockholm, Sweden, 30/Oct/79. 2 CD. 1979-Toad’s Place, New Haven, 15/Noviembre/79, 2CD. 1979-The Palladium, New York, 20/Noviembre/79. 1979-The Palladium, New York, 21/Noviembre/79. 1979-Alexander´s Brown Mills, New Jersey, 22/Noviembre/79. 2 CD. 1979-Paramount Theatre, Seattle, Washington, 18/Dic79. 2 CD. 1979/80-TV Shows (Rock & Pop and Alright Now). 1980-Chorus TV Program, Paris, France, 23/1/80 + Washington Int. 1980-Pavillion Baltard, Paris, France, 25/Enero/80. 1980-Dave Fanning Rock Show, Irish radio 2/Abril/80. 1980-The Palais, Melbourne, Victoria, Australia, 24/Junio/80. 2 CD. 1980-Festival de Reading. 22/Agosto/80. 2 CD. 1980-Reading Festival, 23/Agosto/80. Upgraded version, 2 CD. 1980-Karussell TV Program, Switzerland, 29/Agosto/80. 1980-Musikfestwochen, Winterthur, 30/Agosto/80. 2 CD. 1980-Town Hall, Middlesborough, 14/Septiembre/80, 2 CD. 1980-The Apollo, Glasgow, Scotland, 28/Sept/80, 2 CD. 1980-Rainbow Theater, London, England, 18/Oct/80. 2 CD. 1981-Messin´with the kid, London 11/Ene/81 + Stockholm 14/12/81. 1981-Mystic Eyes, Palais des Sports, París, 13/Feb/81. 2 CD. 1981-Paris, France, 13/Febrero/81. 3 CD. 1981-Gateshead Festival, Newcastle, 29/Agosto/81, 2 CD. 1981-Live In Athens, Nea Philadelphia stadium, 12/Sept/81. 1982-Offenburg, Germany, 16/Enero/82. 2 CD. 1982-Salle Des Fetes, Melun, 5/Marzo/82. 2 CD. 1982-L´Olympia, Paris, France, 8/Marzo/82, 1st Show. 2 CD. 1982-L´Olympia, Paris, France, 8/Marzo/82, 2nd Show, 2 CD. 1982-Vienna, Austria, 18/Aug/78 & Dijon, France, 19/Marzo/82. 1982-Palais d´Hiver, Lyon, France, 21/Marzo/82. 1982-City Hall, Newcastle, GB, 23/Mayo/82. 2 CD. 1982-Manchester Apollo, 27/Mayo/82. 2 CD. 1982-The Apollo, Glasgow, Scotland, 28/Mayo/82. 2 CD. 1982-Have A Drink On Me, Glasgow, 28/Mayo/82 + Interview. 2 CD. 1982-Dominion Theatre, London, 3/Junio/82, 2 CD. 1982-Ludwigshafen, Germany, 5/Junio/82, 2 CD. 1982-Hard Drinking-Great Player, Offenbach, 11/Junio/82. 1982-Music Show, Bologna, 1/Julio/82, 2 CD. 1982-Naos, North Ireland, Punchtown Festival, 18/Julio/82. 2 CD. 1982-Les Arenas, Frejus, 1/Agosto/82. 2 CD. 1982-Chicago, live at the parkwest, 2/Septiembre/82. 1982-San Francisco, Old Waldorf, 25/Septiembre/82. 2 CD. 1982-Follow Me, Loreley Open Air Festival, 28/Septiembre/82. 1982-Jam Session with Burdon, Lindley & other friends. NM. 38´. 1982-Blitz the Ritz, The Ritz, New York, 1/Octubre/82, 2 CD. 1982-Agora Club, Cleveland OH, 4/Oct/82, 2 CD. 1982-Agora Columbus, 13/Noviembre/82, 2 CD. 1982-The Spectrum, Montreal, Canadá, 15/Noviembre/82. 2 CD. 1982-Ripley Music Hall, Philadelphia, 29/Septiembre/82. 2 CD. 1982-El Mocambo, 16/Nov/82 + Providence 82 + 28/Mar/75. 2 CD. 1982-Veteran’s Coliseum, New Haven CT, 11/Dic/82. 1983-Glasgow Apollo, 1983.= Glasgow 82 short version! 1983-Chapiteau, Parc de la Villette, París, 7/Mayo/83, 3 CD. 1983-Marquee, London, 26/Julio/83, 2 CD. 1983-Marquee, London, 27/Julio/83, 2 CD. 1983-Doolin Co Clare, Dublin, Ireland, 30/Julio/83 2 CD. 1983-Lisdoonvarna Festival, 31/Julio/83. 2 CD. 1984-Ulster Hall, Belfast, 6/Enero/84. 2 CD. 1984-Pistoia Blues Festival, Italy, 15/Julio/84. 1984-Ibbenbüren, Open Air Festival, Germany 18/Agosto/84, 2 CD. 1984-Loreley, Germany, 9/Sept/84, 2 CD. 1984-Concert for Ethiopia, Usher Hall Edinburgh, 12/Sept/84. 1984-Tegelen, Holland, 12/Octubre/84. 3 CD. 1985-The Stone, Palo Alto, California, 16/Mayo/85. 1985-The Stone, Palo Alto, CA, 17/Mayo/85. 2 CD. 1985-Alburquerque, NM, Grand Central, 22/Mayo/85. 3 CD. 1985-Cardis, Houston Texas + Acoustics. 26/Mayo/85. 2 CD. 1985-Midwest Ballroom, Cedar Lake, IN, 1/Junio/85. 1985-Nag´s Head, Toronto, Canadá, 4/Junio/85. 2 CD. 1985-Barrymore´s Club, Ottawa, Canadá, 6/Junio/85. 2 CD. 1985-Detroit, Michigan, Live at the Harpos, 6/Junio/85. 1985-Lone star Cafe, New York, 10/Junio/85. 2 CD. 1985-Lupo’s Heartbreak Hotel, Providence, 12/Junio/85. 2 CD. 1985-Boston, Paradise Theatre, 13/Junio/85. 2 CD. 1985-San Francisco, The Stone, 16/Junio/85. 1985-Club Saba, Washington, 18/Junio/85. 2 CD. 1985-Club Saba, Washington, 19/Junio/85. 2 CD. 1985-Chesnut Cabaret, Philadelphia, 21/Junio/85, 2 CD. 1985-Chesnut Cabaret, Philadelphia, 21/Junio/85, 3 CD. 1985-New York, Sundance Bayshore, 28/Junio/85. 1985-Mean Mil Mustards, Reading PA, 29/Junio/85. 2 CD. 1985-Blues Force, Montreux Casino, 5/Julio/85. 2 CD. 1985-Mont De Marsan, Francia, 11/Agosto/85. 2 CD. 1985-Jubeck Festival, 17/Agosto/85. 3 CD. 1986-Clermont-Ferrand, France, 23/Mayo/86. 2 CD. 1986-Les Hall Du Grain, Toulouse, France, 28/Mayo/86. 2 CD. 1986-Dinkelsbühl, Inselwiese, Loreley Festival, 5/Julio/86, 2CD. 1986-Palau Blaugrana II, Barcelona, España, 9/Julio/86. 1986-Sala Canciller, Madrid, España, 10/Julio/86. 2 CD. 1986-Washington, Saba Club, 14/Agosto/86. 3 CD. 1986-Queen´s Hall, Edinburgh, 26/Agosto/86. 2 CD. 1986-Queen`s Hall, Edinburgh memories, 27/Ago/86. 2 CD. 1987-Live in Am Hof, Vienna, Austria, 2/Mayo/87. 2 CD. 1987-Seepark Open Air Festival, Arbon, 8/Agosto/87. 2 CD. 1987-Pavilion Theatre, Glasgow, 10/Agosto/1987 + Interview. 1987-Rock City, Nottingham, England, 12/Oct/87. 3 CD. 1987-City Hall, Sheffield England, 14/Oct/87. 2 CD. 1987-Hammersmith Odeon, London, 16/Oct/87, 3 CD. 1987-Hummingbird, Birmingham, 18/Oct/87. 2 CD. 1987-Brielpoort, Deinze, Belgium, 11/Noviembre/87. 2 CD. 1987-Live In Geleen, Holland, 12/Noviembre/87. 1987-Musikzircus, Hamburg, 15/Noviembre/87, 3 CD. 1987-Metropol, Berlin, Germany, 16/Noviembre/87. 3 CD. 1987-Dusseldorf, Germany, 19/Noviembre/87, 2 CD. 1987-Karlsruhe Schwarzwaldhalle, Germany, 21/Nov/87. 2 CD. 1987-Liederhalle, Stuttgart, Germany, 30/Noviembre/87. 2 CD. 1987-Offenbach Stadthalle, Germany, 3/Diciembre/87. 2 CD. 1987-Rosengarten, Mussensaal, Mannheim, 7/Diciembre/87, 3 CD. 1987-Zürich, Switzerland “live at the Volkshaus”, 9/Dic/87.2 CD. 1988-Dublin, Ireland, Olympia Theatre, 17/Febrero/88. 2 CD. 1988-Dublin, Ireland, Olympia Theatre, 18/Febrero/88. 2 CD. 1988-Dublin, Ireland, Olympia Theatre, 19/Febrero/88. 2 CD. 1988-Dublin, Ireland, Olympia Theatre, 20/Febrero/88. 3 CD. 1988-Kings Hall, Belfast, 25/Febrero/88. 2 CD. 1988-Heppenheim Open Air Festival, Germany, 11/Sept/88. 2 CD. 1988-Wolverhampton, 19/Nov/88 + Mocambo 78 + Toronto 78. 2CD. 1988-Leas Cliffe Hall Folkestone, 28/Nov/88, 2 CD. 1988-Assembly Hall, Worthington, 12/1/88. 2 CD. 1988-St. Albans, UK, 2/Diciembre/88. 2 CD. 1989-Ballyronan Festival, N. Ireland, 29/Julio/89. 2 CD. 1989-Mildenhall Festival, 5/Agosto/89. 2 CD. 1989-Hannover Festival, 18/Diciembre/89, 2 CD. 1990-Ohne Filter, Germany TV, 9/Mayo/90. 1990-Music Hall, Cologne, Rocklife, 17/Octubre/90. 2 CD. 1990-Rock City, Nottingham, 19/Diciembre/90. 2 CD. 1990-Coatham Bowl, Redcar, 21/Diciembre/90, 2 CD. 1991-Melbourne, 28/Feb/91 + Santa Mónica, CA Ago/73. 2 CD. 1991-Club Bene, Sayerville, 2/Marzo/91. 2 CD. 1991-BA Channel, San Diego, 6/Marzo/91. 2 CD. 1991-Omni, Oakland, CA, 14/Marzo/91. 2 CD. 1991-Catalyst, Santa Cruz, 15/Marzo/91. 2 CD. 1991-The Stone, San Francisco, 16/Marzo/91. 2 CD. 1991-San José, California, The Cabaret, 17/Marzo/91. 2 CD. 1991-Guthrie, Minneapolis, 20/Marzo/91, 2 CD. 1991-The Empire, Cleveland, 24/Marzo/91. 2 CD. 1991-Key West, Detroit, MI, 25/Marzo/91. 2 CD. 1991-El Mocambo, Toronto, Canadá 26/Marzo/91 + Interview. 1991-Paradise Ballroom, Boston, MA, 29/Marzo/91, 2CD. 1991-Marquee, New York, 30/Marzo/91, 2 CD. 1991-Huntington, 3/Julio/91 + RTE Radio2 Interview, 2 CD. 1992-Temple Bar, Dublin, 15/Agosto/92. 2 CD. 1992-Town and Country 2, London, 29/Octubre/92. 1992-Live at Leeds, 30/Octubre/92. 2 CD. 1992-Ghost Blues, Stadthalle, Babenhausen, 12/8/92. 2 CD. 1992-Kehl, Germany, 5/Diciembre/92. 2 CD. 1992-Bonn Blues Festival, 13/Diciembre/92, 2 CD. 1992-Bonn Blues Festival, 13/Dic/92, full concert. 3 CD. 1992-Amsterdam, Holanda. 15/Diciembre/92. 2 CD. 1992-Bataclan, Paris, France, 18/Diciembre/92. 2 CD. 1993-Bosembachstadion, St. Wendel, Germany, 26/Junio/93. 2 CD. 1993-Gampel Festival, 21/Agosto/93, 2 CD. 1994-Piazza Duomo, Pistoia Blues Festival, 2/Julio/94. 1994-Auditorium Stravinsky, Montreux 12/7/94, Sound A+, 2 CD. 1994-Sudfest 3 Reitstadion, Stuttgart, Germany, 21/Agosto/94. 1994-Paris, Olympia, 16/Octubre/94. 2 CD. 1994-Talence, France, 13/Diciembre/94. 2 CD. 1995-Enschede, Holland, 6/Enero/95. 2 CD. 1995-Harmonie, Leeuwarden, 8/Enero/95, 2 CD. On French TV, acoustics songs. Unplug This, acoustics from different shows. 2 CD. When the blues comes calling, G-Men project, 3 CD. BBC Radio One Tribute with Paul Jones. Powerful and Velvet from different shows. 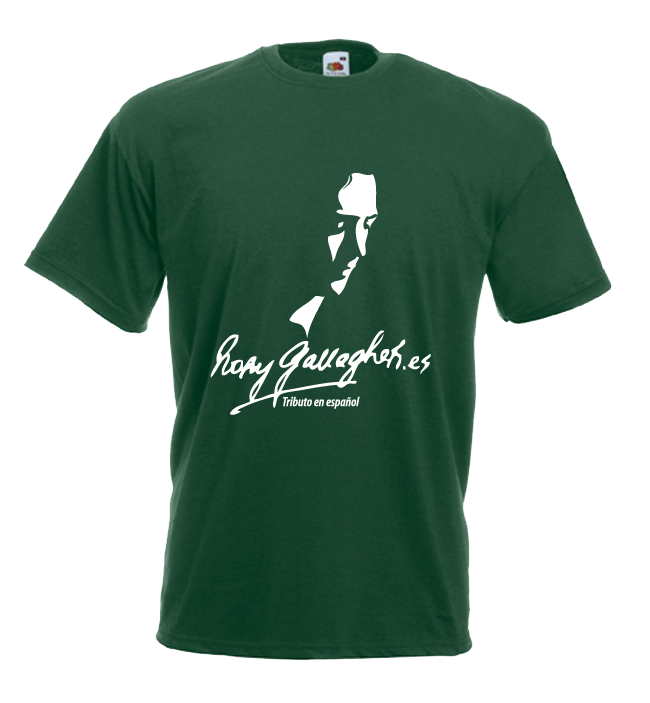 RORY GALLAGHER-Tribute- ¡Gracias! Tributo Made In Spain. 9 songs. 1970-Isle Of Wight, 2 VCD. 1972/73-Houston, Popgala Voorburg & Limerick Savoy, mpg. 1973-OGWT, Febrero/73, two tracks, VCD. 1972/74-Marquee, ?/Abr/72 & DKRC 74, mpg. KTS. 1975-Madrid, Teatro Monumental, 7/Marzo/75, B/W, VCD. 1976-OGWT 2/Mar/76 & Slash intro, mpg. 1977-Me & My Music, Montreux 22/Jul/77 & Middlesex 79, mpg. 1977-Me & My Music 14/Feb/77, Irish TV, VCD. 1977-Rockpalast, Gruga-Halle Essen, 23/Julio/77, VCD. 1979-Montreux Jazz Festival, 18/Jul/79. B/W, mpg. 1980-Paris, Chorus, French TV, 24/Ene/80. B/W, mpg. KTS. 1980-Paris, Chorus, French TV, colour, VCD. 1980-Karussell Special TV, Zürich, 29/Ago/80. VCD. 1982-Jam with Burdon, Lindley & other friends, Loreley, mpg. 1984-Belfast, Ulster Hall, Rory at Midnight, 5/Enero/84, mpg. 1985-Montreux Jazz Festival, 5/Julio/85, VCD. 1986-Live Aid Festival, RDS Stadium, 17/May/86, VCD. 1989-Ohne Filter Extra, 2 VCD. 1990-Rockpalast (Rocklife) 17/Octubre/90 Cologne, mpg. 1992-Bonn Blues Festival, audience film, 3 VCD. 1993-Tegelen Festival, Nederland, 4/Sept/93, audience film. 1995-Paris, from homevideo (audience film), 2 VCD. 2000-From a whisper to a scream, irish doc., VCD. 2000-Irish Tour 2000, Tribute in Cork. Bert edition. ——Tribute from the Rockpalast team, 2 VCD. ——Big Guns Promo Video Documentary. VCD.